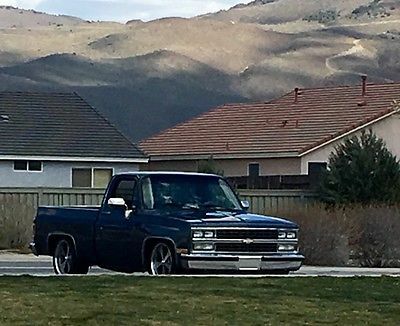 This 1986 Chevrolet C10 is a blast to drive. A freshly rebuilt 30 over 350 with Comp XE274 cam, 10:1 compression topped off with an Edelbrock 2098 power package. The package is rated at 410 HP with 408 ft/lbs torque and includes aluminum heads and Air Gap manifold. A 600cc Edelbrock finishes off the engine. 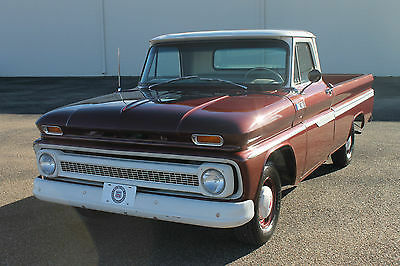 The accessory package is the serpentine setup from a later chevy vehicle including AC! The rebuilt 700r4 transmission includes a "Beast" sun shell with a Yank Performance SS3000 torque converter. The paint does show signs of aging as shown in the pictures. I recommend replacement of the bushings and ball joints on the front end. The interior is completely new, including new carpet, dash pad, door panels, gauge bezel, seat belts and bench seat. new alpine deck with amp powered kick panel infinity speakers up front, and 6x9's in the cab corners with an 8" JL Audio subwoofer. The truck is lowered the correct way with drop springs/spindles up front, and a c-notched frame/leaf spring flip kit in the rear. 20" staggered Ridler wheels with 245/35-ZR 20 and 295/35-ZR20 Pirelli tires. Shipping is full responsibility of buyer. I reserve the right to cancel this listing at any time. Thanks for looking! 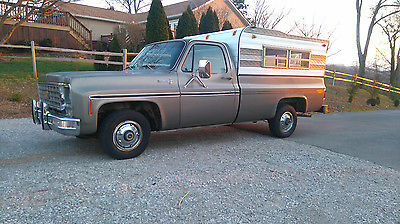 This listing is for a 1972 Chevy C10 Short Wheel Base SWB. This is a TRUE short bed. 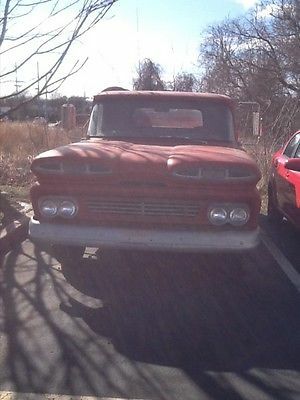 Truck has been in Colorado most of it's life so there is little to no rust. 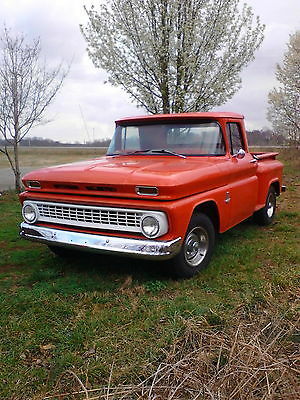 Rocker panels, cab corners, inner & outer fenders, doors all rust free. The frame and suspension are also in great condition. Has a strong 383 Stroker SBC Engine with a Billet dress up kit which includes Billet Pulley's on the water pump, power steering pump, & a chrome finished Alternator. Also has Ceramic Coated Headers with mufflers turned down at the rear axle, Edelbrock 4 barrel carburetor, Brand New Radiator with dual electric fans and a Brand New Heater Core that's not installed yet. The truck runs and sounds awesome. 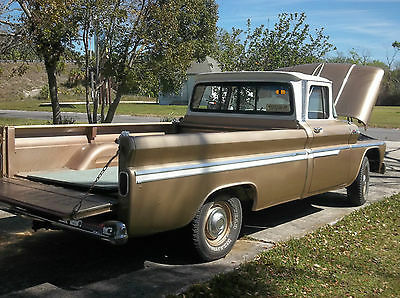 Has a freshly rebult Chevy Hydramatic TH200-4R transmission and the original 4.11 posi-traction rear end. New brake lines and fuel lines with electronic fuel pump. The interior is in excellent condtion with new carpet, new door panels, new upholstery on the seat, new dash pad, new kick panel speakers on both sides, and a Grant Steering Wheel. All new rubber around windshield, back glass and doors. Nice Rally Wheels with tires that are less than 3 months old. Original Glove box options sticker with vin # matching the vin plate in the door jam. All the gauges work great except the speedometer. Front aluminum grill housing needs buffed and polished. NEW PARTS LISTED BELOW: NEW RADIATOR NEW HEATER CORE NEW PARKING LIGHT LENSES NEW FRONT & REAR SIDE MARKS LIGHTS ON BOTH SIDES, NEW TAIL LIGHT LENSES NEW BACK UP LIGHT LENSES NEW RUBBER ON WINDSHIELD & BACK WINDOW NEW FRONT INNER FENDERS NEW INNER & OUTER WINDOW SEALS BOTH SIDES NEW BLACK CARPET FLOOR COVERING NEW SEAT COVER NEW DASH PAD NEW DOOR PANELS NEW KICK PANEL SPEAKERS NEW BRAKE LINES NEW FUEL LINES PLEASE MESSAGE ME WITH ANY QUESTIONS BEFORE BIDDING. FEEL FREE TO CALL OR TEXT ANY QUESTIONS TOO 870-280-8616. MY NAME IS TRAVIS. IF I DON'T ANSWER LEAVE YOU NAME AND NUMBER AND I WILL CALL YOU BACK AS SOON AS I CAN. THERE IS A $500 NON-REFUNDABLE DEPOSIT DUE WITHIN 24 HRS & FULL PAYMENT ON BALANCE WITHIN 7 DAYS OF AUCTION ENDING. SERIOUS BIDDERS ONLY PLEASE. THE TRUCK WILL BE STORED INDOORS UNTIL IT SELLS. 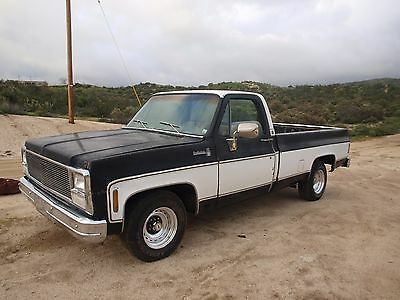 I DO HAVE THIS TRUCK FOR SALE LOCALLY SO I RESERVE THE RIGHT TO END THE AUCTION EARLY BUT WILL NOT DO SO IF THE TRUCK HAS MET THE RESERVE PRICE. I DO NOT NEED HELP SELLING THIS TRUCK. 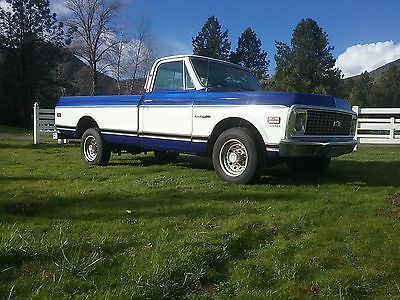 THANKS FOR LOOKING AND HAPPY BIDDING On Jan-07-17 at 13:28:29 PST, seller added the following information: In the item specifics section of my listing under engine it shows 350 V-8 and that is incorrect. This truck does NOT have a 350 V-8. The engine in this truck is a 383 Stroker. Sorry for any confusion. 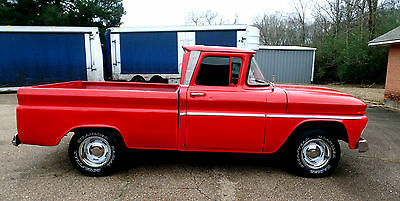 You are bidding on a vintage 1960 Chevy Apache converted into a fire truck. Light work has been done, can be restored. Garage kept for the past 15 years. Local bidding preferred however winning bidder can arrange shipping, this vehicle does not run. This vehicle is complete and I have a clean title. 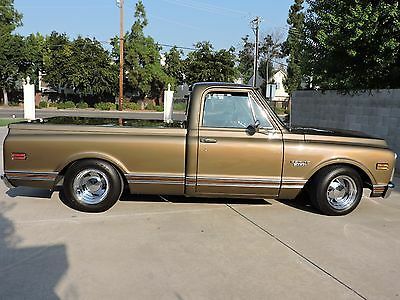 1967 Chevrolet C-10 1967 Chevrolet/Chevy C-10 Custom Fender Bed! NEW MOTOR! 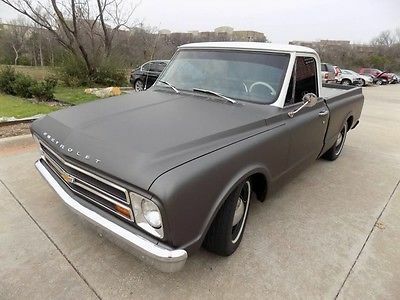 1967 Chevrolet C-10, 3 speed manual transmission with brand new 350 engine long block with 766 miles, complete with Petronix ignition. 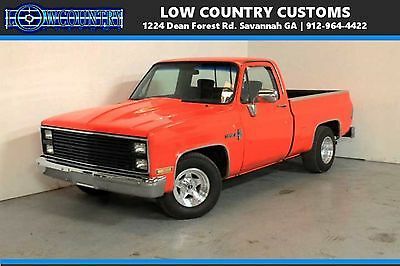 Runs great, a definite head turner and revamp of a classic sought after truck.Two owners previous, numbers matching except for the engine, bed and cowl induction hood, short bed step side. The bed is replaced with an 88 to 92 step side bed and tonue snap cover. (a few snaps are busted and cover not shown in pictures). Minor cosmetic damage. Driver side rear step has a visible crack.Here's a list of things that had been done within the last year by previous owner.Frame stripped, sandblasted and painted.Two-tone paint - interior and exterior.Window felt and weather stripping on all windowsNew tires and drum brakes front and backNew Master cylinder and linesNew interior on seats and dashNew carpetNew radio and speakersFresh rebuild on transmission.New Edelbrock carb, intake, fuel pump and lines. New heater core and heater box and fan.New exhaust and custom tipsNew inner finder wellsRadiatorRadiator support and housing.Note: This was all done with 65000 miles on the original 283 engine which proved troublesome after a couple hundred miles of driving, hence recently installed new engine. Also added a new fuel filter, plugs, water pump and custom coolant reservoir tank.SOLD AS IS: Asking for $18,500 OBO. Motivated seller.Please don't hesitate to contact me with any questions. 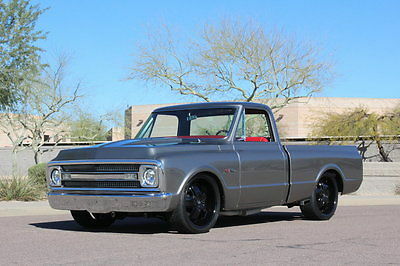 1965 CHEVROLET C-10 Is it possible? Yes! 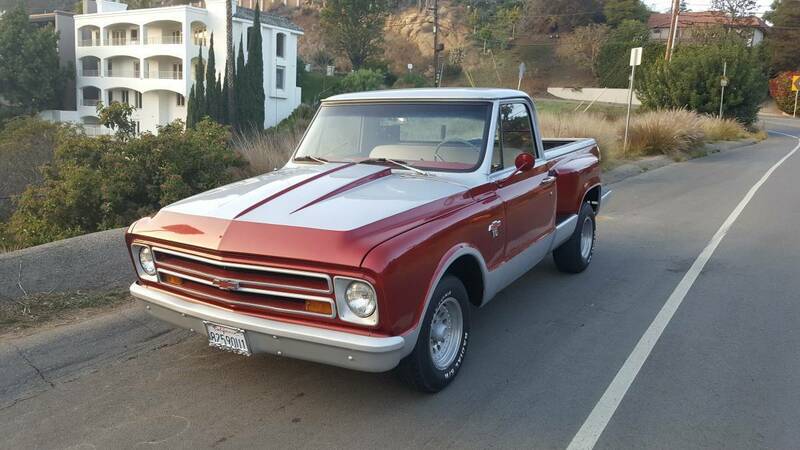 This C-10 is over 50 years old and was purchased new in 2013. It has had one owner. The truck was purchased out of the Lambrecht Chevrolet Dealership collection in Pierce Nebraska. It has gone through a mechanical and cosmetic make ready. The drive train is all original and has been serviced and prepared to drive. In all instances where possible, the original equipment was retained and simply cleaned or serviced. Only where parts were missing, damaged, or beyond repair were replaced or cosmetically reconditioned. A complete list of the services and repairs are noted in the pictures. All of the original paperwork comes with the truck. The original miles are showing and everything is in working condition. We look at all trades and invite independent inspections. WE ACCEPT TRADES For more information and photos please visit http://www.vaitx.com or call Vintage Autohaus & Imports at 806-359-9600. This vehicle is being advertised locally, we reserve the right to remove the listing at any time. We will accept trades. ZERO FEEDBACK OR NEWLY SIGNED UP BIDDERS MUST CONTACT US FIRST. DISCLAIMER This vehicle is being sold as is, where is with no warranty, expressed written or implied. No allowance or set aside will be made on account of any incorrectness, imperfection, defect or damage. Any descriptions or representations are for identification purposes only and are not to be construed as a warranty of any type. It is the responsibility of the buyer to have thoroughly inspected the vehicle, and to have satisfied himself or herself as to the condition and value and to purchase based upon that judgement solely. The seller shall and will make every reasonable effort to disclose any known defects associated with this vehicle at the buyer's request prior to the close of sale. Seller assumes no responsibility for any repairs regardless of any oral statements about the vehicle.